Why Use Doceri iPad App as an Interactive Whiteboard? Doceri iPad app is a remote desktop app which mimics the functionality of an interactive whiteboard. 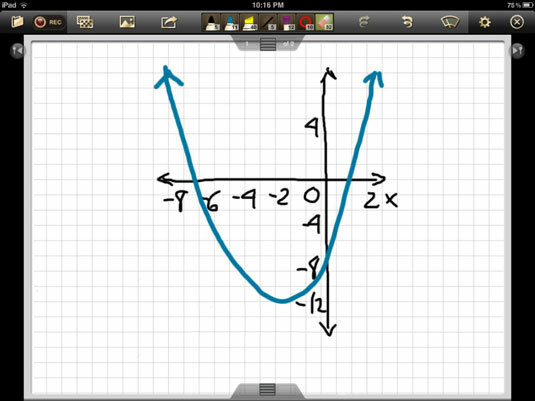 With an iPad whiteboard app, you can use your iPad to illustrate concepts in front of your class. There are many whiteboard apps for the iPad that you might use in your classroom. But why use Doceri? What can you do with Doceri in your classroom? Drawing over presentations, webpages, applications, and more: Doceri displays what’s on your computer, and you can switch to Drawing mode and anything on your computer PowerPoint, Keynote, an Internet browser, or any other desktop application can easily be annotated. Switch to Drawing mode during any presentation, and Doceri gives you a complete selection of tools to paint, mark up, highlight, insert images, and more. Doceri records any actions you take while in Drawing mode on a timeline that you play back and edit. Connecting to a computer or creating content directly on the iPad: Doceri also lets you write and edit projects without being connected to a computer. Instead of displaying a computer, you can select a custom background for a whiteboard. Select different colors, types of graph paper, maps, and more. You can even create your own custom background. So why Doceri? Using Doceri, you can prepare your lesson presentation in advance or present it live in front of the class. Using Doceri’s timeline-based authoring platform, you can prepare your presentation in advance, edit, save, and replay it for your class at any speed. You can go back and work with your annotations, refine them, rearrange, clean up, and improve the overall quality of your screencast. Doceri also has a separate Record function that can capture and record all screen video and voice; you can also save your project as a movie to be shared. Most apps enable mirroring of what you see on the iPad screen. Doceri shows only the actual drawing content; it doesn’t display the onscreen controls (which can be extremely distracting). Also, Doceri’s AirPlay output is always in landscape mode, and iPad rotations do not result in a rotated image on the AirPlay output.